Cooking for me, is different. Sometimes I love to do it, sometimes I do it only because I know I need to eat. From the days of when I first started cooking after I moved out (my mother never let me learn in her kitchen) when I was making boxed, canned or bag prepped meals to now, where it’s my own mind’s creation in the pan. For about 5 years now, I’ve made it a goal to just about never make the same thing twice. I have my staples, those favorites that you just can’t get enough of. But 90% of the time, you’ll never see me make the same thing twice. Being a clean eater, that can get hard. I’ve blown through recipes in my Clean Eating Magazine and my cookbooks for clean eating. I’ve taken recipes from cookbooks my mother has given me and others I have bought over the years, and cleaned them up so that they follow the eating guidelines for clean eating. Most of the time, cleaning up a recipe is pretty easy. Take the processed out, add the fresh in. When I finished cooking all of my cookbooks, I got creative and started doing it on my own. I feel comfortable enough in the kitchen and confident enough in the flavors of food, that I can do it. Sometimes, I’ll start with a clean dish and just feel that I need to give in and dirty it up a little. Which is what happened last night. I was cooking my pasta. Frying my chicken with Italian seasonings. Boiling my snow peas and snap beans from my garden and frying up some red peppers when I wanted spicy. 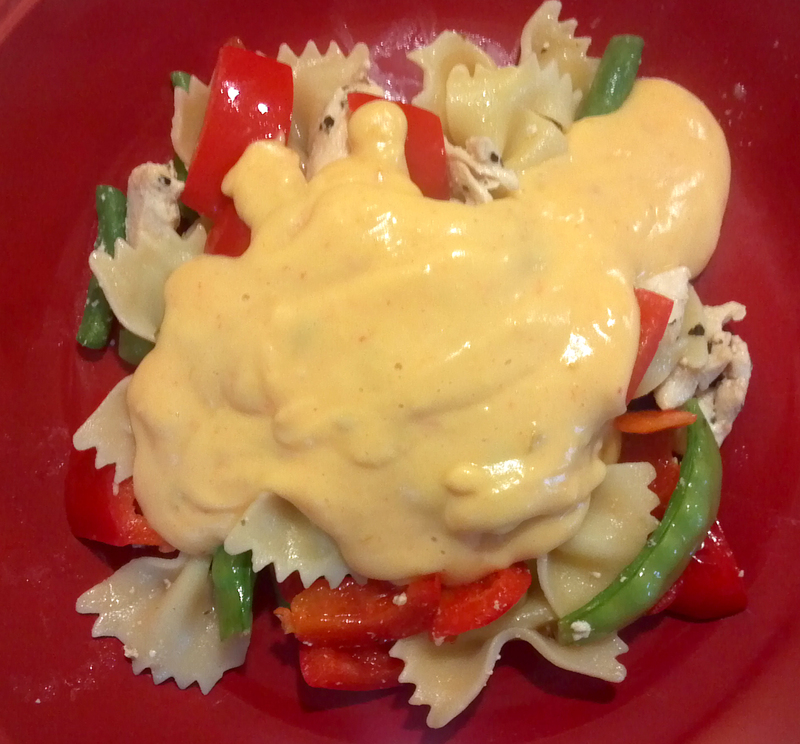 So I made my own cheese sauce with salsa con queso. It was delicious – and only slightly dirty. Cook pasta according to package instructions, set aside in strainer. Place olive oil in 8-inch fry pan, sprinkle Italian seasonings over and heat on medium heat. Cut chicken into 1-inch cubes, add to fry pan, mixing in seasonings to coat. In pot used for pasta, boil snap beans and snow peas in their shoots. Strain and add them to strainer your pasta is in. Once chicken is fully cooked, add in with pasta and greens. Dice the red pepper, cook on medium-high for about 4 minutes. Add to strainer with rest of ingredients. Add capers, toss with tongs. Ready to serve if you’re looking for a “clean” meal. If you want it dirty… here’s the sauce: Whisk together milk, queso and flour over a medium heat until thick, usually about 10 minutes. 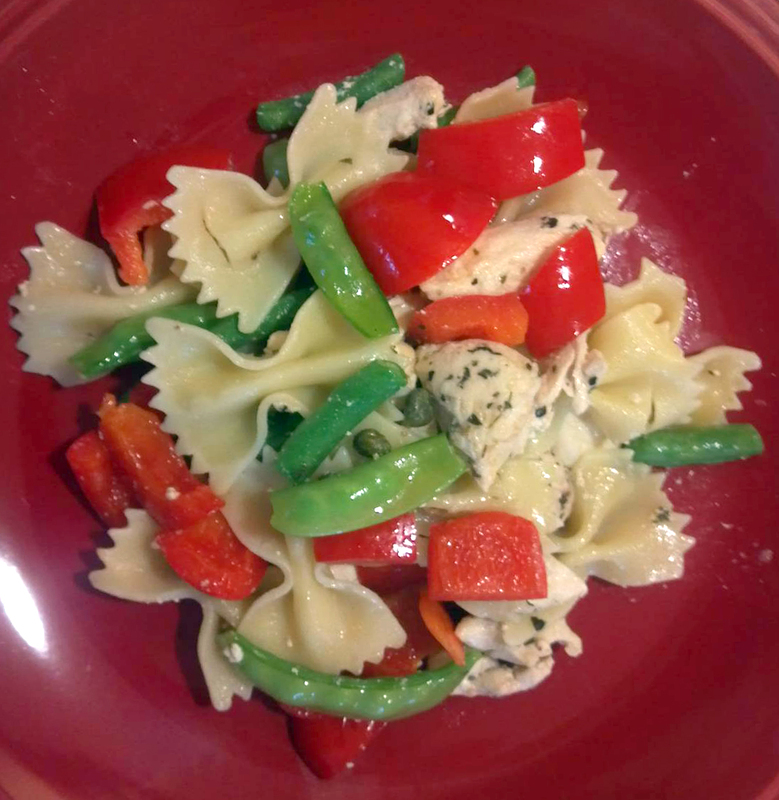 Spoon over plated chicken, veggie and pasta mix. Clean: Serves 4, 273 calories, 21g carb, 2g fat, 43g protein. Dirty: Serves 4, 324 calories, 27g carb, 4g fat, 46g protein. Welcome to the Apple house.